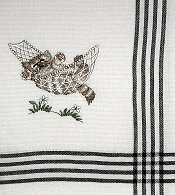 This 100% cotton waffle weave kitchen towel features an embroidered kitten resting in a hammock. The towel is 19" wide x 28" long. The embroidered kitten and flowers are 4" wide x 3 1/4" high. Note: because this towel is 100% cotton, cool wash and dry. Towel becomes softer with each wash.